Yes, Russia is laughing. At him. 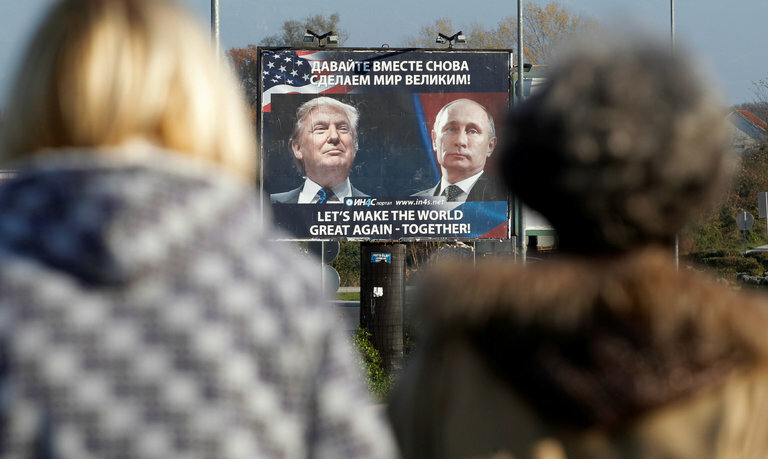 If there has been any benefit from Russia’s interference in the 2016 election, it’s that it has raised awareness about President Vladimir Putin’s broader threat to democracies in Europe and elsewhere. In the face of complacency from Republicans fearful of what attention to these intrigues might reveal about the Trump campaign’s dealings with Russia, Democrats on the Senate Foreign Relations Committee have issued a report that appears to be the most comprehensive public accounting of Russia’s war on the West. It drives home the point that the 2016 election, which every American intelligence agency has said involved Russian interference to help elect Donald Trump, is part of a pattern in which Mr. Putin has worked to erode Western institutions and undermine faith in democratic practices. Few countries in Europe have escaped his malign intrusions. The reportshould serve as an alert for the United States to work urgently with its allies to protect democracy. There is a significant impediment, however, and that is President Trump and the congressional leaders who enable him. Mr. Trump persists in his bizarre fascination with Mr. Putin and refuses to acknowledge that Russia poses a security threat, even though his own recently released national security strategy says Russia, along with China, seeks to “challenge American influence, values and wealth.” Republicans in Congress have expressed more concern about those who revealed Russia’s meddling than about the meddling, and have done nothing to ensure it cannot be repeated. According to the report, the Kremlin is spending far more on foreign propaganda outlets, and on nongovernmental groups and political parties opposed to the European Union and NATO. It enlisted organized crime groups to launder money and commit other crimes, and used its control of energy supplies to spread corruption, the report said. Russia used cyberwarfare, disinformation and military force to inhibit ties to the West by Georgia and Ukraine. The Kremlin is also trying to undermine Serbia’s efforts to integrate with the West by exploiting connections between the Russian Orthodox Church and Serbians and through its near monopoly on energy supplies. Russia has weakened democracy in Hungary and Bulgaria, both members of the European Union and NATO, and has drawn them closer to Mr. Putin’s orbit. The Kremlin is spreading its reach into Mexico and the Middle East. This activity would be troubling at any time, but more so now when the president has denied there has been Russian meddling, refused to criticize Mr. Putin and has seemed more interested in rewarding Moscow than confronting it. The report was produced without Republican input, which gives it a partisan cast it does not deserve, especially since it acknowledges that the threat posed by Mr. Putin existed before the current administration came to office. Democrats hope the report will increase pressure on the administration to put into effect sanctions Congress overwhelmingly enacted last year with a deadline of Jan. 29. “Never before in American history has so clear a threat to national security been so clearly ignored by a U.S. president,” Senator Ben Cardin, the top Democrat on the Foreign Relations Committee, said in a letter attached to the report. By contrast, Europe, as the report notes, has begun to push back. Germany pre-empted Russian interference in its elections by warning the Kremlin that meddling would bring consequences, by forging an agreement among political parties not to use bots or paid trolls, and by ensuring cybercooperation between the government and campaigns. Spain has led Europe in cracking down on Russian-based organized crime groups. The Baltic States have beefed up defenses against cyberattacks and disinformation and diversified energy supplies to avoid overreliance on Russia. NATO and the European Union have focused on cyberdefense. As the report points out, there are many things besides sanctions that should be part of a comprehensive American strategy, including helping to strengthen democratic institutions in vulnerable European countries, exposing and freezing Kremlin-linked dirty money and building a coalition to counter Russian hybrid threats. But most important is leadership, which so far Mr. Trump has refused to provide. On Twitter, he denounced the Democrats for releasing the report and, once again, said he had not colluded with Moscow. “Russia & the world is laughing at the stupidity they are witnessing,” he wrote. He’s right, but he doesn’t realize who is being laughed at.